What is Evil Speaks about? The lords of the underworld have joined forces to open the ancient gates of evil. Seven teens must stop the gates from opening: Kami is deaf, Amir is blind, Zuma is overweight, Layla is gorgeous but lazy, Chaz is in a wheelchair, Benny is a loner, and Raj is as angry as the purple dagger-shaped birthmark running down the side of her face. They are quirky teens who must become warriors. But they can barely save themselves. What made you put special needs characters in this series? It wasn’t intentional so much as these characters appeared to me from all of my interactions with special needs individuals over the years—they inspire me. My website has stories of RL Warriors (Real Life). I wrote these characters into a screenplay around 2002, but I set that aside to work on my novel Unveiling. When I went back to it, the story had evolved into an epic mythological fantasy. I always wanted these characters to be superheroes. Clark Kent has flaws; he’s a bit of a bumbler, but as Superman, he is confident, can fly and has superpowers. In Evil Speaks, Amir is blind and vain about his looks but in the underworld, he has super vision; Kami is deaf but she gains super hearing, and Chaz is in a wheelchair but he can walk in the underworld. If regular people like Clark Kent can become superheroes, so can children with challenges. As in life, each character must also grapple with his or her personal problems. Layla, for instance, is gorgeous but insecure. She has low self-esteem; she feels her beauty is her only asset and she didn’t work for that. How long did it take you to write Evil Speaks? I will answer that by saying my first novel Unveiling took years. It was historical and multicultural and required massive research. I also gutted it twice to change directions. In hindsight, this seemed like a waste of time. With Evil Speaks, I sat down and came up with a repeatable plan, using the 8-essential plot points and 3-act structure. I worked on character development before anything else. Then I filled in my plot-planner scene by scene. It was a lot like writing the bones of a screenplay. I like to write full days, not piecemeal. I set a goal to crank out the first draft over summer vacation. When I sat down to write, it flowed easily from scene to scene, changed at times, bust stayed on course. I knocked it out in ten weeks. The revisions took months longer, and I ultimately added a chapter. You can find a section titled “Writing Lessons” on my editor’s website at SWoffington.com, where I lay out the system point by point for others. Start with “Writing Lessons: Introduction” under Recent Posts or pick a topic from the list. What do you like best about the fantasy genre? You can go anywhere, do anything! You can create entire universes (or underworlds) full of crazy characters and locations. History (or mythology) always comes into play for me. It’s clearly just part of who I am as a writer, as are international settings. 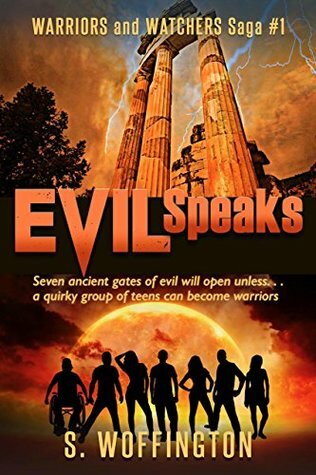 Evil Speaks is an international quest. You work as a developmental editor as well. What mistakes do you see most often? I love helping authors hone their fiction or improve their techniques. Every author I’ve worked with has strengths and weaknesses: maybe the dialogue is strong but the descriptions and details are weak; or the descriptions are amazing but the dialogue is stilted or it does not fit the character or all characters sound alike. Two basic concepts are critical to every manuscript: 1) avoid passive verbs (every page must have strong active verbs), and 2) “show” don’t tell, meaning write a scene and let me see the glistening sweat dripping down the side of someone’s face, plopping onto the contract and wicking the freshly penned signature into a fuzzy black Rorschach image; don’t say “He was sweating as he signed the contract” (this is also passive). You advocate inclusion on the WarriorsandWatchersSaga.com website—can you tell me about that? Since writing Evil Speaks, I’ve learned that special needs children are bullied five times more often than other children. I’m shocked by this. I put tips for education, intervention and inclusion on my site for parents and educators. I’m using Deer Valley’s “Disability Awareness Activity Packet” in the classroom. Prevention starts with education. Along with that, every parent, educator or librarian should ensure our children read literature with special needs characters. Books create closeness to characters, and that creates empathy in the reader. Empathy can enable children and adults to leap past the page to make friends with special needs individuals and include them in society. You’re working with a publicity company for the launch of Evil Speaks. What has been your experience with this? I love it! I interviewed many companies. One company would have worked to increase my on-line presence alone for $500/month, but I wanted more. I chose Smith Publicity, because they have a long track record of working with authors. They helped me design a campaign to fit my budget. I decided to make the investment, because I’m writing a 7-novel series. It seemed prudent to get the word out on book one. The publicist sends review requests to book bloggers, sends out requests for author interviews for radio or television, sends out press releases, lines up book signings, and more. I wanted a team approach, and that’s what I received. I’m very happy with my publicist Katie. She works as hard for me as I do for myself. The Smith Publicity website is packed with media tips for authors, such as “101 Book Marketing Ideas to Promote Your Book.” In short, do your homework, have realistic expectations, and stick to your budget. Woffington is a California native, whose thirst for adventure began when reading1001 Arabian Nightstales as a child. In her twenties, she lived in Saudi Arabia and England, spent months in Italy, and traveled extensively. After completing UC Irvine’s Humanities Honors Program, she earned dual Master’s in English and Creative Writing from Chapman University. Her stay in Saudi Arabia inspired her debut novel Unveiling, which won Honorable Mention from Writer’s Digest SP e-book awards. Woffington teaches middle grade students at a Montessori school. During Summers, off, she writes fiction and works as a freelance developmental editor. Previous Post BURNING DOWN THE SYSTEM TO THE GROUND? Next Post 10 Tips For Proof-Reading and Editing!